Vane Compressors are also known as Rotary Vane Air Compressors use a centrifugal motion to generate compressed air rather than the reciprocating motion of the compressor piston pump. Another make of air compressor that uses centrifugal motion is the rotary screw compressor which uses a gear to build air unlike the vanes used in the vane compressor design. In an air tool, compressed air enters the inlet port which is plumbed to the smallest compartment of the vane-housing inside the air tool. Compressed air moves from an area of high pressure as it enters the air tool the air “wants’ to move to an area of relative low pressure, that being back to atmospheric pressure outside the air tool. 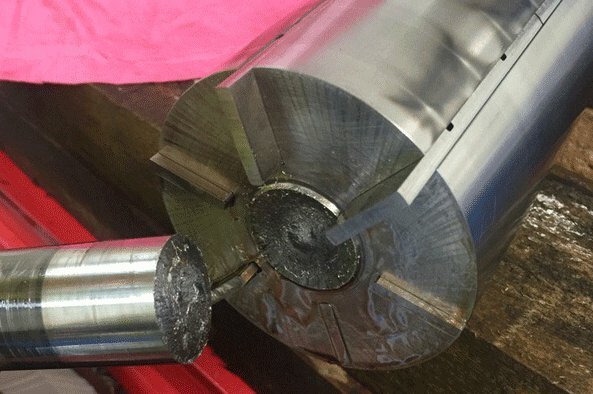 As the air moves inside the tool from the high pressure area to the low, it too moves the vanes causing a centrifugal motion of those vanes and a rotary motion of the shaft to which the vanes are connected. 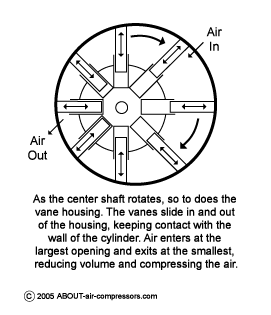 In a vane compressor, the rotating of the shaft is the same, as is the motion of the vanes inside the outer cylinder. In the Rotary Vane Compressor though, rather than compressed air being the power source to move the vanes and drive a shaft and do work, it is typically an electric motor that rotates the vanes, to draw in free air, and compress it as the vanes rotate, generating compressed air power to run a huge variety of compressed air-driven equipment. Road repair / builders and building construction crews can use rotary vane compressors too. The vanes in these are typically powered by a gasoline, diesel or sometimes even a propane engine. The vanes inside the vane compressor are installed in an eccentrically located centre housing. The vanes are able to slide in and out. Though all the vanes may be the same length, their reach inside the vane housing depends on where they are in relation to the outer barre as the vane housing is off-center in relation to the outer barrel. Centrifugal force or internal springs continuously press all the vanes against the inner-wall of the outer barrel as the housing rotates inside the compression chamber. This seals each vane against the outer surface, creating relatively air tight compartments within. Where the volume between the vanes is largest, free air is drawn into the compressor vane-housing through an inlet valve. As the center shaft continues to rotate, and since it is off-center to the cylinder, the succeeding compartments between the vane are smaller and smaller, being closer to the outer wall. The result is a larger volume of air is compressed into a smaller volume and the now-compressed air is released through another valve into a compressor tank or compressor receiver or into the shop air mains. Many (most?) vane air compressors do not have a high pressure and low pressure cut out setting that would stop the motor periodically, but are designed to have the motor run continuously. The motors freewheel when tank pressure is reached, when they are unloaded, no longer sending air into the tank, and reducing load on the motor by the unloading process. Vane Compressors can come equipped with an external enclosure, so the compressor looks like a large metal crate. Aside from the cosmetic value, the housing usually provides sound attenuation. It is usually needed. Rotary vane manufacturers suggest their units are more compact than other types of compressors, yet can provide more compressed air output than similarly sized reciprocating units. Rotary vane compressors claim a longer life expectancy in continuous duty applications. Mind you, the same claim is made by some manufacturers of rotary screw air compressors too. Manufacturers claim that Rotary Vane units are easier to service than other types of compressors, and that they are ideally suited for moderate-pressure using applications. It is my impression that rotary vane compressors are not the typical first choice for industrial compressed air applications yet are now gaining in popularity, particularly outside of North America. A few folks have asked questions about vane compressors, as can you, using the form at the bottom of this page. If you see a question you can help answer, please add a comment. This helps all of us. Got a question about Vane Compressors? If so, do add it here, and please upload some photos focusing on the problem area?